Modern and new ausgetattetete duplex apartment (about 90sqm) in 3 parties house on 950qm plot with pool, pool house and fitness center. in a quiet location above Bodrum center. The apartment was very nice with great views over Bodrum. The aircon worked well and is needed. Generally the apartment was clean and tidy and comfortable. We had some minor issues with the pool house which had not been cleaned before our arrival this was done on our second day, the sun shades around the pool were tatty and needed to be replaced, this was sort of done while we were there. There were also some issues with the hot water supply which seemed to be an ongoing problem. We met Mitra the owner who invited us out to dinner I presume was a goodwill gesture, unfortunately we had already made other arrangements. We didn’t have a car so needed to get taxis to and fro Bodrum as it’s a 20min walk in the blistering heat, they are cheap £3 each way. We went to this part of Turkey for a Scuba Diving course which was fantastic but I don’t think we will go back here again. It was a pleasure to host you in Bodrum. I am so sorry that you will not come again to Bodrum. We enjoyed our stay in Villa Abracadabra immensely; the villa, the garden, the pool - everything is very well cared for. The view of Bodrum from the balcony is amazing – during day time many white house and at night time city lights. Mitra is a very great host; she responds to emails and texts immediately and Enver is always just a phone call away. They are both most helpful. On our arrival Enver showed us where to do our shopping, and he waited for us and took us back to the house. We spent some days by the pool in the garden; some days we went on tours, e.g. Kos and Pamukkale and some days we walked to Bodrum city centre - just a 15-minute walk away. Coming home to Villa Abracadabra after busy days was just a treat. We had a wonderful time in Bodrum and we highly recommend Villa Abracadabra to anyone visiting Bodrum. It was a bit hard to find the villa, but once we arrived it was a beautiful and clean villa. We were happy there was a big private pool. And u could walk to the center, beach etc. 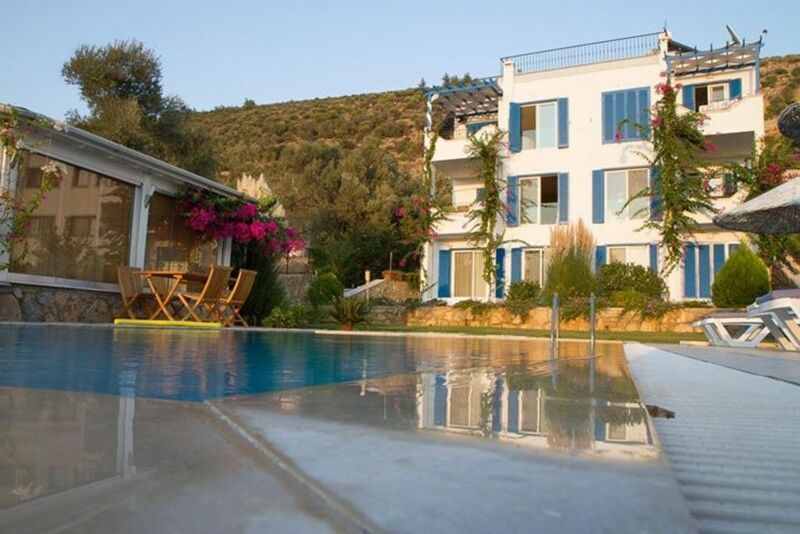 I would definitely book this villa again if i was in Bodrum again. The owner and his assistant were very helpfull. MANY THANKS to Mitra for her warmth and hospitality during our stay in Bodrum! She is an amazing hostess. Enver was very helpful and always just a phone call away. We spent a week in Villa Abracadabra in early July 2013. Mitra took care of everything for us (car rental, transportation, tours, restaurant reservation, etc.). She is a very friendly and caring host. Villa Abracadabra went above and beyond our expectations as communicated through the vacation rental listing. It is a chic and charming place with a private swimming pool and a beautiful view of town. We had a wonderful time in Bodrum and will definitely stay in Villa Abracadabra if we are in Bodrum again. We highly recommend Villa Abracadabra to anyone visiting Bodrum. I hope we meet soon again either in Bodrum , Germany or Atlanta. We found our Apartment very clean and well equipped with everything we needed. It is situated in a very good place about a 15 minute walk to Bodrum where all the restaurants, beach and shops are. The garden is beautiful and we had a lovely relaxing stay around the pool which was very clean and there was a pool house with toilet facilities. We also had great views from our balcony of Bodrum and the castle. We would like to thank Mitra for welcoming us to her Villa and Enver for all his help during our stay. We will definitely consider this for our holiday next year. Thank you, it was a pleasure to have you as guests. Looking forward to meet and greet you again. Thank you Mitra for your attention to detail and thank you Enver for the pick-up and drop-off and for being on hand. We returned to Ireland well rested and content!! In Bodrum are next to the bazaar the Underwater Archaeological Museum and several ancient excavations interesting targets, as well as taking a stroll through the old town with the secretive gardens and old stone houses, you can make some nice discoveries. The Greek islands are within sight and Kos / Rhodes are worthwhile destinations for a day trip. The same applies to Pamukkale (Kalkterassen), and the ancient cities of Ephesus (Artemis Temple) and Aphrodisias which can be accessed on some longer day trips. For active and adventurous a visit to the Aqua Park is recommended, guided jeep safaris and mountain biking tours, a round at the nearby neighborhood of Frankfurt golf course, Parsailing, horseback riding or hiking through the beautiful nature between Bodrum and Mumcular. In addition to the town beach (on foot in 10 min. Attainable) are recommended beaches in Bitez, Yashi, Camel Beach and Ortakent. In Yalikavak and Türkbuku to also find a number of chic beach clubs. All beaches are water sports such as waterskiing, jet hire, Banana and Ringo Rides and partly. Windsurfing and parasailing. In Bodrum several diving centers PADI and CMAS offer training and diving boat trips. Also there deals for deep sea fishing. Why not on a day trip, the magnificent coastline - comfortable aboard a gulet (traditional motor sailer) or sporty aboard a 42 'yacht (with skipper) - Discover. Sunbathing, swimming and snorkeling in secluded coves. Bodrum is known for its nightlife on the entire Aegean coast. At night the Cumhuriyet Street, also known as 'Bar Street' and offers entertainment for all tastes. Live music, local and international DJs and show dancers, everything is offered. Or visit one of the world's few open air nightclubs as Halikarnas or celebrate at sea aboard the floating clubs.